Noon. Economist John R. Lott Jr. discusses his new book, Freedomnomics: Why the Free Market Works and Other Half-Baked Theories Don't, in conversation with Jared Bernstein of the Economic Policy Institute and Michael New from the University of Alabama, at the Cato Institute, 1000 Massachusetts Ave. NW. Call 202-789-5229 or e-mail events@cato.org to RSVP. The FBI is looking into concealed-gun permits issued by the Sacramento County Sheriff's Department, according to documents filed in a lawsuit that alleges former Sheriff Lou Blanas issued permits as political favors. The well connected are already favored by discretionary permit systems, but this just exaggerates the problem. This is yet another case of government funded data not being shared with other researchers. The warmest year in the last 100 is 1934, not 1998. These graphs were created by NASA's Reto Ruedy and James Hansen (who shot to fame when he accused the administration of trying to censor his views on climate change). Hansen refused to provide McKintyre with the algorithm used to generate graph data, so McKintyre reverse-engineered it. The result appeared to be a Y2K bug in the handling of the raw data. McKintyre notified the pair of the bug; Ruedy replied and acknowledged the problem as an "oversight" that would be fixed in the next data refresh. NASA has now silently released corrected figures, and the changes are truly astounding. The warmest year on record is now 1934. 1998 (long trumpeted by the media as record-breaking) moves to second place. 1921 takes third. In fact, 5 of the 10 warmest years on record now all occur before World War II. Anthony Watts has put the new data in chart form, along with a more detailed summary of the events. The effect of the correction on global temperatures is minor (some 1-2% less warming than originally thought), but the effect on the U.S. global warming propaganda machine could be huge. . . . . Thanks very much to John Lazar for pointing this out to me..
WASHINGTON — Frequent tours for U.S. forces in Iraq and Afghanistan have stressed the all-volunteer force and made it worth considering a return to a military draft, President Bush's new war adviser said Friday. "And I can tell you, this has always been an option on the table. But ultimately, this is a policy matter between meeting the demands for the nation's security by one means or another," Lute added . . . . If you are having troubles getting enough people in the military, there is a simple solution: increase pay. The notion that you can save money by reinstituting the draft is simply an illusion. True the government doesn't have to spend more, but it is a big tax on many of those who would have been able to earn a lot of money outside of the military. When you include the value of that foregone output, the cost of the draft is much higher than simply paying people more to join. It is pretty obvious that this guy hasn't had even basic economics. I guess that it would have been helpful if Ms. Marjorie Signer had actually explained why my research showing that the liberalization of abortion rules increased crime contained "many unfounded, fallacious, racist, and confused assumptions." "Lott offers so many unfounded, fallacious, racist, and confused assumptions that his overall opinions are useless," said Marjorie Signer, spokeswoman for the Religious Coalition for Reproductive Rights, in a statement sent to Cybercast News Service. "To speculate that abortion is responsible for various and sundry social trends is irresponsible and misses critical points," she said. "Abortion has always been an option that women at all socioeconomic levels have considered, and many abortions are performed for medical reasons. Trying to correlate abortion with social trends smacks of pseudo-science and shows little understanding of women's lives and decisions," Signer added. . . . .
John Donohue also refused to comment on the actual research, but was reduced to saying this: "I am a social scientist, however, so Lott's behavior has in my mind, put him outside the bounds of scientific discourse." That will certainly settle the debate, though I can understand why Donohue is reluctant to actually discuss the facts on this issue. Since John Whitley co-authored this paper with me, does Donohue's statement tar Whitley also? 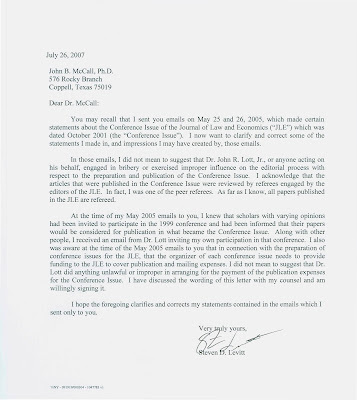 Donohue also doesn't comment on recent issues regarding his co-author Levitt. Click on above letter to enlarge. 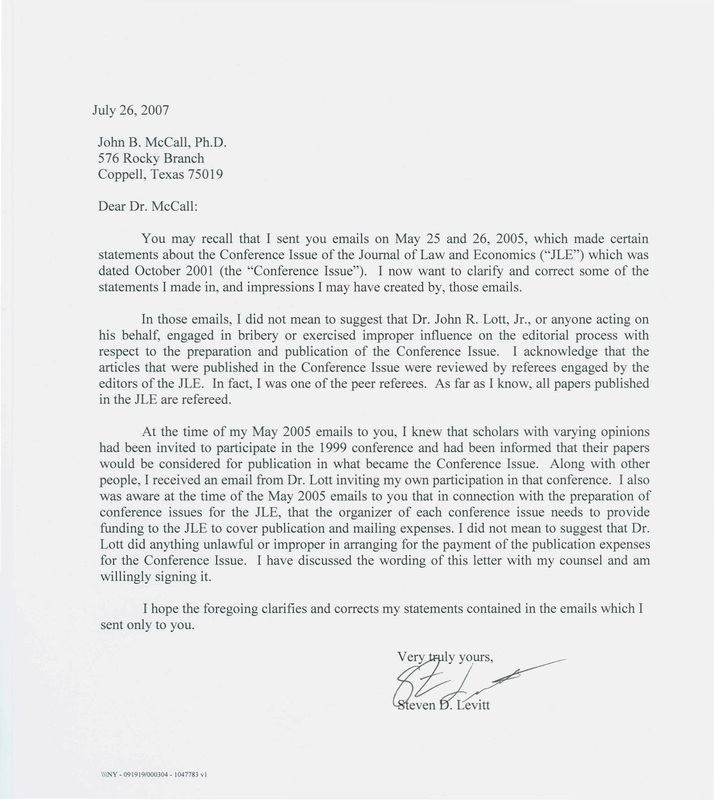 "I also was aware at the time of the May 2005 emails to you that in connection with the preparation of conference issues for the JLE that the organizer of each conference issue needs to provide funding to the JLE to cover publication and mailing expenses. 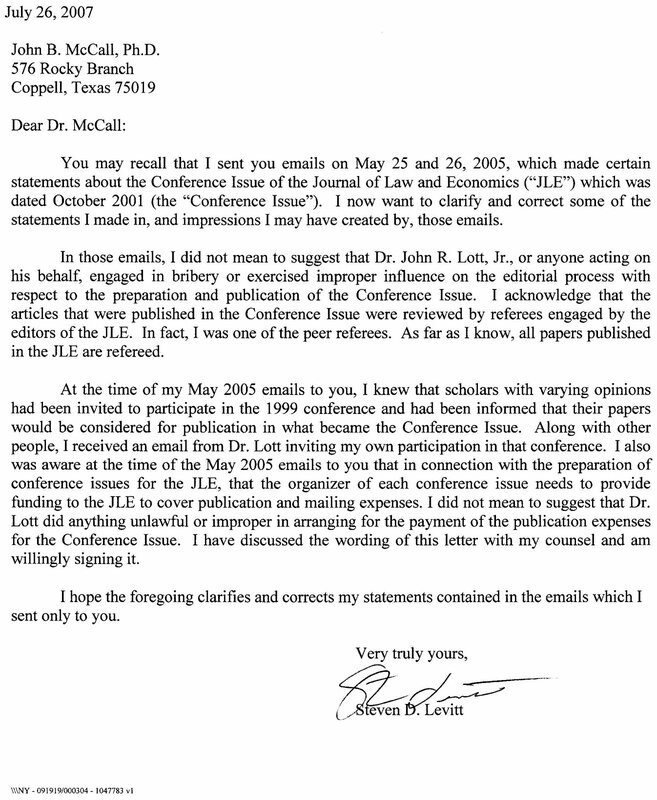 I did not mean to suggest that Dr. Lott did anything unlawful or improper in arranging for the payment of the publication expenses for the Conference Issue." The Chronicle of Higher Education has had a couple of articles on all this, including characterizing Levitt's letter as offering "a doozy of a concession." See this from the Chronicle. One point that wasn't directly mentioned by anyone is that Levitt's response when asked to backup is claim that others hadn't replicated my research was that the research papers were not refereed. Not only is Levitt acknowledging that the papers backed up and replicated my research, but he is admitting that the papers that did so were refereed. The date on this letter does not match when I received it. Update: See also this follow up filing. You also state that others have tried to replicate [Lott’s] research and have failed. Please supply me with appropriate citations so that I might check for myself. There was a NRC/ natl acad of sciences panel I was part of about research on guns that came out in 2004. That will point you in the right direction. . . . I went to the website you recommended -- have not gone after the round table proceedings yet -- I also found the following citations -- have not read any of them yet, but it appears they all replicate Lott's research. The Journal of Law and Economics is not chopped liver. It was not a peer refereed edition of the Journal. For $15,000 he was able to buy an issue and put in only work that supported him. My best friend was the editor and was outraged the press let Lott do this. Returning to the $15,000 bribe issue of JLE and -- although I have not yet gone (I will find it tomorrow) to the NRC/natl. acad. of sciences panel you recommended -- I am wondering whether those deliberations were published somewhere, and, if so, who paid for that. Could such not have been essentially the same thing? I noticed that this issue of JLE was the results of a conference on crime safety and guns that was sponsored by AEI and the Yale Center for Studies in Law. I understand how your best friend the editor could have been outraged, and I hope he had the principle to resign his position in protest. However, we all eventually realize that an editor is but a small cog in a big wheel. In sum, Freedomnomics is just the sort of product one would expect from an author whose book begins with the assertion, "The free market works," and whose economic analysis starts with these words, "If something becomes more costly, people will do less of it." Such frankness would have resonated with the late Merryle Rukeyser, a blunt talker who once repeated these no-nonsense definitions on his son's popular financial program: "A liberal is someone who's liberal with other people's money, and a reactionary -- that's someone who can count." I am not really sure that I understand what some people are thinking sometimes. If you were a terrorist, how would you attack? That's the question a New York Times blogger posed Wednesday on the newspaper's Web site. Steven D. Levitt, in a controversial posting on the paper's Freakonomics blog, has invited fellow bloggers to submit their worst-case scenarios for a terrorist attack. Instead of setting up a forum to educate terrorists an alternative approach was suggested to me: "put up a website on how to CATCH terrorists (and criminals) more easily. The how-tos should be sent secretly to FBI,CIA, police." This cliché of government intervention might not be the effective long-term solution for the economy that many trust it to be. John R. Lott, Jr., PhD, author of the newly-published book Freedomnomics: Why the Free Market Works and Other Half-Baked Theories Don’t, believes that government intervention into a free market can adversely affect the economy. Lott further maintains that many so-called “market failures” actually become profit opportunities for those people who work to solve the problems. Dr. Lott was at the Heritage Foundation last Wednesday to discuss his book and explain his thesis supporting a free economy despite its shortcomings. Lott drew upon multiple examples from his book to prove that the free market works most effectively with as little government intervention as possible, and is actually able to solve its own market failures over time, contrary to popular opinion. Also, Lott expounded upon the long-term domino effects that touch society when the government exercises sufficient power. . . . . The House of Representatives almost turned into the Fight Club Thursday night, when Democrats ruled that a GOP motion had failed even though, when the gavel fell, the electronic score board showed it winning 215-213 along with the word FINAL. The presiding officer, Rep. Mike McNulty (D., N.Y.), actually spoke over the clerk who was trying to announce the result. In the ensuing confusion several members changed their votes and the GOP measure to deny illegal aliens benefits such as food stamps then trailed 212-216. Boiling-mad Republicans stormed off the floor. The next day, their fury increased when they learned electronic records of the vote had disappeared from the House's voting system. . . . .
Mr. Foley also made a very prescient warning. . . . . should [Democrats] win back control that November . . . "Democrats [should] clearly and intensely [promise] that if they take the majority back again, they will not go back and try to pay back, so to speak, what they felt were the excesses and even the outrages of this period, but will promise minority rights in reaching those majority decisions." Clearly, his fellow Democrats in the House haven't been following his advice. . . . . This is a pretty powerful piece. The entire piece is interesting. by my estimate, Bonds’ front arm “armor” may have contributed no fewer than 75 to 100 home runs to his already steroid-questionable total. . . .
For years, sportswriters remarked that his massive "protective" gear – unequaled in all of baseball -- permits Bonds to lean over the plate without fear of being hit by a pitch. Thus situated, Bonds can handle the outside pitch (where most pitchers live) unusually well. This is unfair advantage enough, but no longer controversial. However, it is only one of at least seven (largely unexplored) advantages conferred by the apparatus. . . . . I wonder whether there will be a difference in the change in crime rates between the summer and winter with these cameras. Surely there are fewer crimes that take place in the winter, but my guess is that the drop will be smaller then because in Chicago (one of the cities mentioned in the story) most people where some hood or face mask, thus negating the benefit of the camera. Most people in the United States have no reservations regarding the use of video cameras in public places as a way to improve safety, according to a poll by TNS released by the Washington Post and ABC News. 71 per cent of respondents support having public surveillance cameras, while 25 per cent do not. . . . . This article only mentions the prison term faced by Fingerhut. But of course he will have to provide full restitution and fines. He is retired so he doesn't have to look for a job again because if he did (as I have pointed out in Freedomnomics), he would have an almost impossible task. There is also a high probability that his wife will divorce him and take most of his assets. In his day, Bert Fingerhut was a Wall Street player. A top-ranked securities analyst for eight straight years, making calls that moved markets, Mr. Fingerhut rose to director of research at Oppenheimer & Co. in 1980. Three years later, he retired to Aspen, Colo. He was 40 years old. In the Rockies, Mr. Fingerhut became as passionate about conservation as he once was about stocks. He joined the boards of a string of environmental organizations. So devoted was he to the wilderness that he got married in Wyoming's Grand Teton National Park. But he couldn't get Wall Street out of his system. In the 1990s he picked up a copy of Peter Lynch's "Beating the Street," in which the former star manager of the Fidelity Magellan Fund wrote of a "can't-lose proposition (almost)" called bank-conversion investing. When mutual, depositor-owned banks convert to public companies, Mr. Lynch noted, they must let depositors buy stock at the initial-public-offering price. The new shares are often priced at a discount. So "the next time you pass a mutual savings bank or an S&L that's still cooperatively owned," Mr. Lynch suggested, "think about stopping in and establishing an account." Mr. Fingerhut took the advice to heart, and then some. Starting in 1995, he opened accounts at more than 400 banks across the country, from Wellsburg, W.Va., to Covina, Calif. He eventually got in on public offerings at many of them, and flipped their shares for quick profits. Over a decade, he made $11 million from the strategy. There was one problem: The way he did it, he was breaking the law. In May, Mr. Fingerhut pleaded guilty to conspiring to defraud banks and their depositors by secretly using other people as fronts to open accounts for him, thus increasing the number of IPO shares he could buy. He forfeited all the money he earned from the strategy. On Friday, a federal judge in Newark, N.J., sentenced the onetime star stock analyst to two years in prison. Thanks to Jack Langer for sending this article to me. Yesterday's Manchester Republican Committee fundraiser was a blast. Literally. GOP boosters got the chance to fire machine guns in exchange for a $25 contribution. About 300 people came to the Pelham Fish & Game Club to shoot tommy guns and M16s at bowling pins three feet in the air. They raised between $2,000 and $2,500, split between the Manchester GOP and the club. "Isn't it exhilarating?" said Jerry Thibodeau, president of the Manchester Republican Committee, amid the rattle of machine gun fire. "It's like driving in the Indy 500. Vroooooooom." . . . .
-- I thought that the Dems were upset about government no bid contracts (that is those under Bush even though the same ones were the same under Clinton). Some companies stand to gain from Pelosi's earmarks. The California Democrat has won funding for six companies in a 2008 defense funding measure. One is a $4 million request to develop a ``novel viral biowarfare agent'' for Prosetta Corp., based in her San Francisco district. Tom Higgins, the company's chief executive officer, says he talked to the Speaker's staff directly rather than hiring a lobbyist and hasn't given money to her campaign. ``We're just a little company,'' he says. Another of Pelosi's earmarks was $2.5 million to Bioquiddity, Inc., a San Francisco biotech company with nine employees, to continue developing drug-infusion pumps. Bioquiddity President Josh Kriesel, who ran unsuccessfully as a Republican for the state legislature in 2002, has donated $6,000 to the Democratic Congressional Campaign Committee since last September. The company received a total of $3.9 million in earmarks in the last two years. Kriesel declined to comment directly on the earmarks. Pelosi has said some earmarks are ``worthy.'' And she said there is a distinction between those for public projects, which she sometimes touts with press releases, and special interest earmarks. . . . . The race between Democratic presidential front-runners in the early state contests has tightened in the past month, defying national polls that show Sen. Hillary Rodham Clinton with a sizable lead. . . . .
A Seattle mother of four was fatally stabbed early today despite a court protection order against her knife-wielding ex-husband. The 33-year-old victim was stabbed nearly two dozen times while attending a birthday party about 1 a.m. at the Veterans of Foreign Wars hall in the 9100 block of Martin Luther King Jr. Way South. The 39-year-old assailant burst into the hall, grabbed the victim and slashed her with a large knife, witnesses told police. The weapon was recovered at the scene. A 32-year-old Kent man who was at the party pulled a hand gun and shot the suspect who later died at Harborview Medial Center. . . . . The utilities provision, or the so-called renewable electricity standard amendment, was among the most contested measures in the energy bill. Sponsored by Representative Tom Udall, Democrat of New Mexico, and several others, it will force utilities to make a significant share of their electricity from solar, wind, geothermal, water and other nonfossil fuel sources, although they can meet part of the requirement through conservation measures. The standard applies only to investor-owned utilities and exempts rural electric cooperatives, municipal utilities, the Tennessee Valley Authority and the state of Hawaii from the mandate. . . . . If cutting back on carbon dioxide is so important, why do these rules only apply to "investor-owned utilities"? Surely municipal utilities should also count? What about Hawaii? Carbon dioxide is being added to the atmosphere every place. Why does the administration only threaten to veto based upon the lack of oil production in the bill? A man who helped thwart an armed robber's escape from a Bessemer bank in May died this morning in a bulldozer accident in western Jefferson County. Christopher Lynn Chappell, 41, was accidentally killed at 8:15 a.m. by the bulldozer he was operating, said Jefferson County Sheriff's spokesman Sgt. Randy Christian. It is believed he became entangled in the track of the bulldozer and was run over while working alone. Deputies and the Concord Fire Department responded, but Chappell was pronounced dead on the scene. On May 14, Chappell was a customer at the Wachovia Bank on Ninth Avenue in Bessemer, when a gunman opened fire, killing bank employees Eva Hudson and Sheila McWaine Prevo. Two other bank employees, Anita Gordon and LaToya Freeman, were wounded. Chappell, who was approaching the bank and heard the gunfire, got his gun from his vehicle and confronted the gunman as he was leaving, forcing him back inside and giving law officers time to respond.. Thanks very much to James Roberts for sending this to me.